New issue of Uncut Magazine features Velvet Underground on the front cover. New issue of Mojo magazine features Roger Waters / Pink Floyd on the front cover. FREE CD! THE WALL RE-BUILT: DISC ONE! MOJO celebrates the 30th anniversary of Pink Floyd’s dark masterpiece with an exclusive re-recording featuring Sweet Billy Pilgrim, The Young Republic, The Amazing, Astra, Woodpigeon and many more. PINK FLOYD: It has been his greatest obsession for 30 years, but how does the creator of The Wall view his tormented triumph today? With a Broadway version in the works, MOJO’s David Fricke joins Roger Waters for an emotional journey back through time. PLUS! THE WALL LIVE! The inside story of Floyd’s legendary 1980 tour! The album will be released by Mute in the UK. Krautrock charts the history of this influential music genre, from its roots in free jazz, psychedelia and the music of Karlheinz Stockhausen, to the groundbreaking experiments of Faust, Kraftwerk and Can. listing of music blogs links: Music Blog Master List at Pretty Much Amazing! MIC Norway: Tord Gustavsen Ensemble heads out on UK tour - Mid-Occtober sees masters of lyrical Nordic piano-driven jazz, Tord Gustavsen Ensemble, heading out on a UK tour. RA picks the November festival highlights from across the globe. Winter may be almost here in the northern hemisphere, but that simply means it’s all kicking off down south. We’ve got boats, stadiums and airfields for you this month. Allow RA to be your guide to all things November and festivals.. It is this very week that PopMatters passes a milestone and celebrates our Tenth Anniversary in existence: ten years of interviews, reviews, thorough features, and smart, analytical cultural commentary. JA JA JA - A big Nordic Music Affair! Ja Ja Ja is an exciting new monthly club night in London showcasing the best emerging talent from the Nordic countries: Denmark, Finland, Iceland, Norway and Sweden. Peverelist is set to drop his debut full-length next month. With his position as manager of Bristol's premier new vinyl stockist, Rooted Records, Tom Ford has found himself at the centre of the city's burgeoning dubstep scene, with his Punch Drunk imprint now established as one of the go-to labels for listeners and DJs looking for a forward-thinking take on UK bass music. His own productions have been one of the primary reasons why Punch Drunk has become so lauded, forging influences from jungle, techno and dub to create a sound that is very much his own. Punck Drunk will release Jarvik Mindstate in November 2009. Electronic music expert and Wall of Sound label boss Mark Jones host the fourth in his series of shows exploring the origins of synth pop. This week, Mark is joined by electro pioneer Gary Numan to talk about his career and upcoming tour. Underworld will release the first in a two-part compilation series next month. 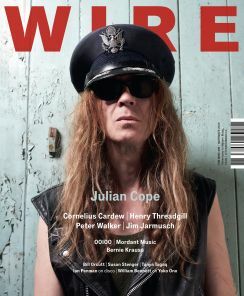 New issue of The Wire features Julian Cope on the front cover. The Quietus | Features | A Quietus Interview | David Sylvian Interview: From Japan To Manofon, The Man Revealed - David Gavan talks to David Sylvian about why there's no 'I' in Manofon . .
With Moogs turned up to 11, a 1970s/80s journey through the BBC's synthpop archives from Roxy Music to New Order. Listen Again - Electronic music expert Mark Jones hosts the third in his series of shows exploring the origins of synth pop. This week he's joined by Rusty Egan, a founding member of 80s electro group Visage. So to follow on from my feature in the mag I've had a few requests to supplement '2009: The Year That Dubstep Broke' with a playlist blog feature. So I put together a time-line of references. For anyone who's a wee bit lost - the feature was based around the fact that this year we've seen what over the past decade has not only consolidated itself as the most important British dance-culture of the past ten years, but arguably organic UK genre, full-stop, explode in alarming fashion. Fabric will release Fabric 49: Magda on November 16th, 2009. After two singles on Hyperdub, and a release on Soul Jazz, King Midas Sound's ‘Waiting For You’ is the debut album from Roger Robinson and Kevin Martin's new group. This international improvising ensemble has been going since 1984 with various members, but a couple of years ago leader and legendary Norwegian sax and clarinet player Frode Gjerstad handpicked a new band of musicians that has meant something special for him during his long career. The title of this monumental 3CD set is relevant on several levels. Between the youngest and oldest musician there are some fifty years, they come from three continents and they cover a wide range of musical ideas with their unique blend of acoustic, electric and electronic instruments. Frode Gjerstad wanted this to be a celebration of improvised music and we can only agree that he has succeeded on all levels. NEGURA BUNGET — the Romanian band that incorporates elements of black metal, progressive metal, folk metal and dark ambient — has set "Vîrstele Pamîntului" (English translation: The Ages of the Land/Earth) as the title of its new album, tentatively due in early 2010. 63. Of Montreal- Hissing Fauna, Are You the Destroyer? full list via: Swear I'm not Paul: List: Uncut's Top 150 Albums of the 00s notice the absence of metal, prog, jazz and experimental electronic music.